I have no idea why this cake is called a hummingbird cake. I did a quick search on the web and came up with no definitive answer. Some say that this cake is so good that you will hum while eating it. Others say that birds are drawn to sweet nectar and the sweetness of pineapple is reminiscent of nectar. I found a lot of references to the cake being of Southern US origins but no one knows for certain. The ingredients were as varied as the theories on the name. But most recipes seem to have pineapple and banana, but I also saw some recipes which included coconut, mango and nuts (mainly pecans). I got this recipe from Emily Luchetti's Four-Star Desserts cookbook and she got it from an Australian chef who used to serve this cake in her Perth cafe. I opted for a basic cream cheese frosting to top my cupcakes. 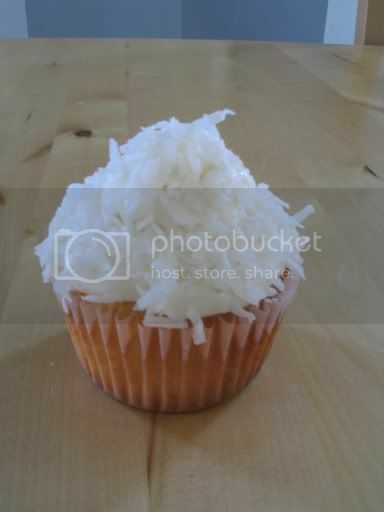 But no matter the origin or ingredients, this is a wonderful tropical inspired cupcake. 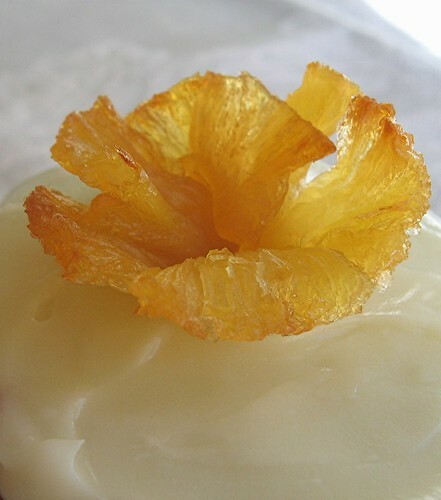 And it's made even prettier when topped with a dried pineapple "hibiscus flower". I wish I could take credit for the pineapple flower idea, but I learned about it from "the Martha". Maybe my crepe cake would've been better with flowers? Preheat oven to 350F. Line 24 (3.5-4 fl oz capacity) muffin wells with paper cupcake liners. Sift flour, sugar, baking soda, salt, cinnamon, and allspice into a large mixing bowl. Stir in melted butter, eggs and vanilla until just combined. Gently fold in pineapple and banana. Fill the muffin wells about 2/3 to 3/4 full. Bake until golden brown and a cake tester comes out clean, about 23 to 27 minutes. Allow cupcakes to cool in muffin pan for about 5 minutes and then gently remove them from pan and let them cool completely on a wire rack before frosting. One 8-ounce brick of cream cheese, softened at room temp. With an electric mixer or with a wooden spoon, beat cream cheese, butter, lemon juice and vanilla until light and creamy. Beat in the powdered sugar until well combined. Frosting can be stored in the refrigerator for 2 days. Bring to room temperature before frosting your cupcakes. Preheat oven to 225 degrees. Line two baking sheets with parchment paper or silicone sheets. Transfer pineapple slices to baking sheets. Bake until tops look dried, about 30 minutes. Flip slices and bake until completely dried, 25 to 30 minutes more. Pinch the center of each dried pineapple slice to shape into a cone (it's easier to pinch you've left the core). Let cool in a clean egg carton (or something similar) to form flowers. Refrigerate in an airtight container up to 3 days. ~ Because of the cream cheese frosting, I store the frosted cupcakes in refrigerator. I would let them sit at room temperature for about 20 minutes before serving. ~ In addition to cinnamon, I used a bit of allspice in my cupcakes. I think pineapple goes really well with allspice. Feel free to leave it out. ~ My pineapple slices were a bit on the thick side since my pineapple was too ripe. Thinner slices would be better. Mary this is really lovely. Cream cheese frosting is always one of my favorites. I found this recipe in several books but never a definitive origin. Who needs to know when it's so good to eat! Nice. I've never seen flowers done with pineapple slices before. I'll have to add that to my bag of tricks. What a great cupcake! It so inviting. I am with everyone else - loving the flower! I love hummingbird cake. Your pineapple flower is a lovely touch. Who thinks up things like this? I wish I was this creative. I love when food and recipes have strange, seemingly not related names. The cupcakes look beautiful too. What adorable little pineapple flower garnishes! I'm definitely going to have to try these some time! As soon as I read the title my first question was: "Why is the cupcake called like this" and then I saw that you began immediately with the explanation... interesting. Love the flavors that go into this cupcake. The taste must have been amazing. And the decoration on the top is so sweet and delicate looking. These are gorgeous!! And even if the flower wasn't your idea, they turned out wonderful. I'm going to have to try this sometime! Those cupcakes looks so pretty. I love the pineapple flowers - nice touch! You are so delicate and talented, Mary - the cupcakes are adorable! Hi Mary - what a gorgeous cupcake! I too have always wondered about the name, but have yet to come up with anything. In any case, I'd never let it stop me from enjoying one of yours - complete with beautiful flower! I love those decorations on top! Gorgeous~ lovely cake, frosting and flower! Ah that Martha!! Mary, these hummingbird cupcakes look delightful! And from the list of ingredients, they have to taste amazing as well. :-) The little pineapple flowers are the perfect finishing touch...so pretty. Love your blog! I tried the recipe and it had great flavor, but too much butter. I would use one less cube next time. There was oil in the bottom of the muffin tin and they turned out flat. 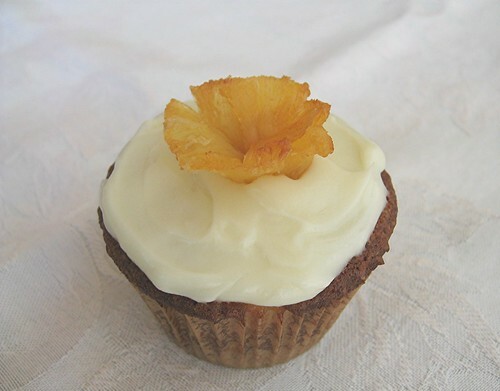 i made these yesterday, and didnt have a fresh pineapple so I used a 1/2 can of crushed pineapple instead. Next time I will use fresh or diced as the crushed pieces were too fine to offer anything more than a really subtle taste.